Fasten your seat belts kiddies because this... is... SPACE ROCK!!! 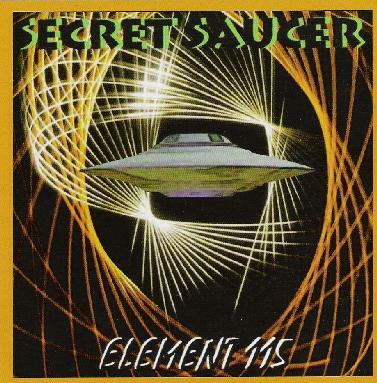 Secret Saucer are something of a Space Rock All Star Band consisting of members (and ex-members) of Architectural Metaphor, Quarkspace, Star Nation, Nick Riff, Sun Machine, and Blaah. The entire album was recorded in a weekend when the musicians got together, rolled the tapes, and just jammed. The lineup includes Greg Kozlowski, Steve Hayes, Steve Taylor, Dave Hess, Bill Spear, Thom Marianetti, Paul Williams, Jay Swanson, and Dan Schnell, with several of the musicians playing different instruments on various tracks. The spirits of Hawkwind and particularly early Pink Floyd are all over the music, as are some Krautrock and progressive rock influences. The result is a completely mind-bending set of space rock instrumentals that stretch out and explore the realms well beyond the Earth's atmosphere. And what makes this such a fine set of jams is that the music succeeds in freeform exploration while at all times being structured and goal oriented rather than raw and chaotic. More in the Hawkwind domain is "The Traveler", an interesting blend of Hawkwind and early 70's jam rock, not unlike a space rock version of Derek and the Dominoes. "AMBQSM" is like a spaced out Allman Brother's jam, though an energetic rocking Hawkwind sound ultimately takes over. And "Beyond Time" is a killer Hawk styled jam that closes the set without coming back to Earth. Nope... Secret Saucer have decided they're enjoying the voyage... and we're all staying out there in space jam heaven together. Visit the Dead Earnest Records web site at: http://www.deadearnest.btinternet.co.uk.